"Plan B" is our latest Tuesday night soccer champion, taking out "Rebels FC" in the finals by the score of 4-2. In the first round of the playoffs "Plan B" took care of business, defeating "Back That Pass Up" 3-1. On the other half of the bracket through "Rebels FC" shocked "United", taking down the top team from the regular season in penalties by the score of 5-4. In that championship game "Plan B" was as stoic as ever, defeating a hopeful "Rebels FC" squad that was riding high after their upset. They put up a good fight, but "Plan B" was just too good. 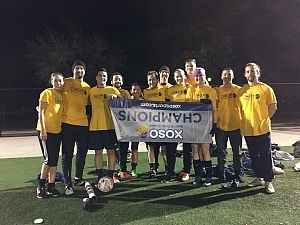 Overall "Plan B" finishes with an 8-1-1 record on the season, thanks largely in part to their outstanding defense. In their 10 games, our champs would pick up 5 clean sheets, including three straight to start the season. Also, the two goals allowed in the championship game was the most they allowed all season. In total they allowed just 5 goals! Congratulations to "Plan B" on win! It definitely has to feel good to get back to the podium after a disappointing first round exit in the fall league. Nicely done!